Before we began our activities, I asked the group some simple open-ended questions. 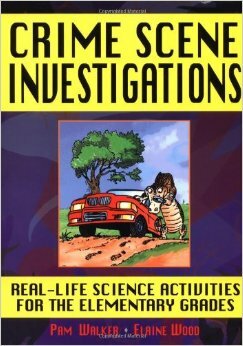 We discussed what kind of evidence might be found at a crime scene, and some of the techniques we thought might be used to find clues and identify suspects. An enlarged Worksheet 1 for Investigation 3-4 on pg. 152 (separate bones from a human skeleton) onto an 11×17 piece of cardstock, and then I cut out the bones and placed them in baggies for each team. 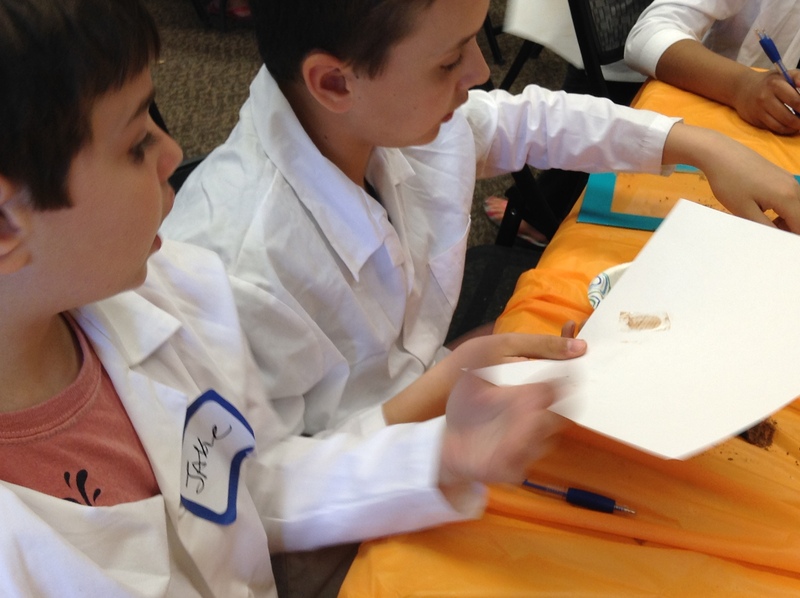 With Halloween around the corner, there have been a series of thefts in neighboring middle schools – pieces of skeletons from the science labs in each school have been stolen. The police have arrested someone who had a box full of random bones, and our teams have to sort through the bones they are given, reattach what they can to our school’s partial skeleton, and then identify which bones don’t belong to us and need to be sent on to other schools. I allowed my scientists to work in groups of up to 5 people. 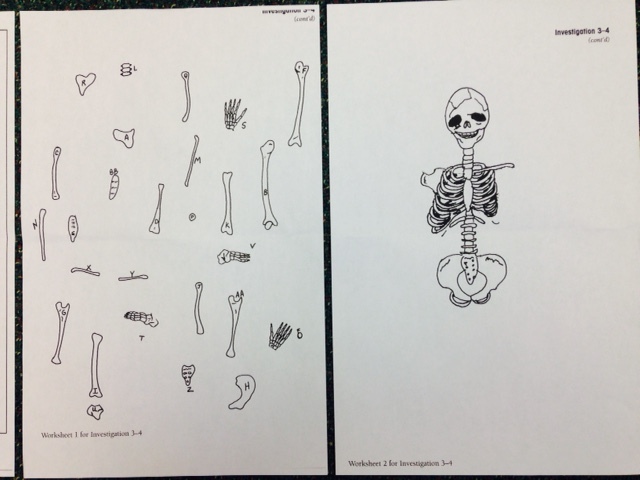 They each had a full diagram of a skeleton from the book, a large sheet with our partial skeleton, and a baggie of bones. Their task was to place as many bones as possible on the skeleton with their tape, and also identify which bones were “extra” and needed to be sent elsewhere. The groups did a great job assembling their skeletons in the time allowed, and most were able to identify at least some of our extra pieces. As a group, we determined that the trickiest bones to place where the arm and leg bones, as some of them were very similar in shape (we had some arm bones placed as leg bones, and vice versa). Each table received three small containers. One contained a sample of vegetable oil (our control); one contained a sample of “Trim & Terrific”; and one contained a sample of “Fat Buster.” I asked each scientist to cut 3 small squares of paper from their brown paper lunch bags. Size did not have to be exact; I did, however, encourage them to make sure the paper was one layer thick and didn’t included a fold. We first took a look at our control, the vegetable oil. 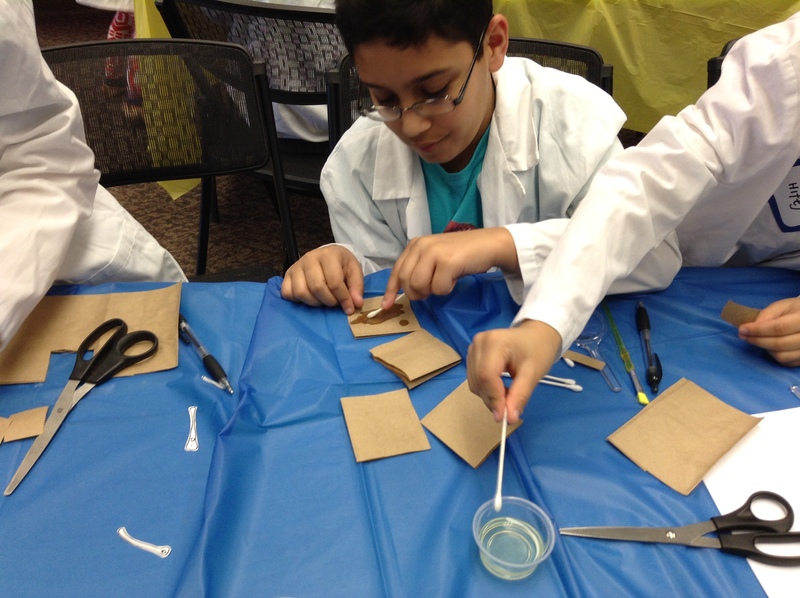 Each scientist dipped a Q-tip in the oil, and then rubbed the Q-tip on a square of brown paper. [There is no need to go end-to-end on the paper; you just want a good sample of the product rubbed on the paper.] Our group consensus was that the vegetable oil (which we know is high in fat) made the brown paper translucent (see-through). It was easiest to see this result by holding the paper square up to the light and moving our hand behind the paper. Next step was to test each of the butter samples in a similar way. We made sure we labeled our brown squares as #2 (for Trim & Terrific) and #3 (for Fat Buster) so there would be no confusion about our results. The scientists then dipped separate Q-tips in each of the butter samples, and rubbed the samples in turn on the appropriate brown bag squares. I personally found that the easiest way to notice the difference in results was to then flip the brown bag squares upside down on the table surface. Some of our scientists smeared a bit too much butter on the brown bag swatches, which made the ultimate results less accurate. However, most scientists accurately agreed the “Fat Buster” sample (at 10 grams of fat) was more translucent and thus was our liar with the false labeling. 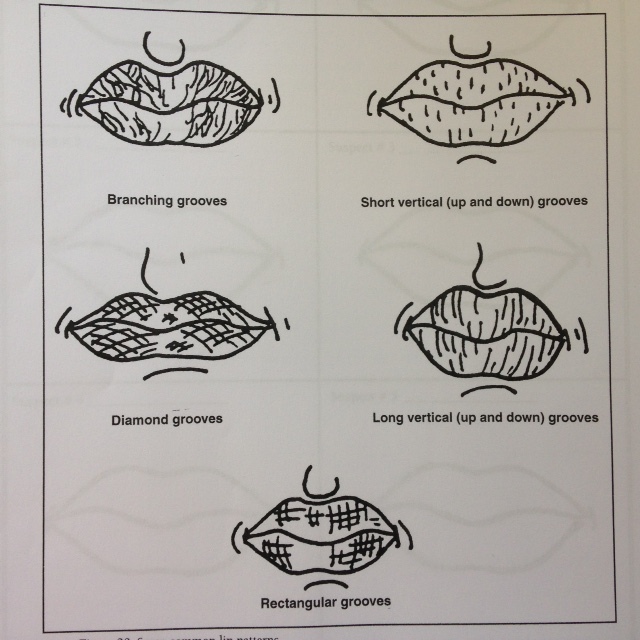 “Learning from Lipstick” – What’s in a pucker? Photo copies of 5 suspect lip prints. 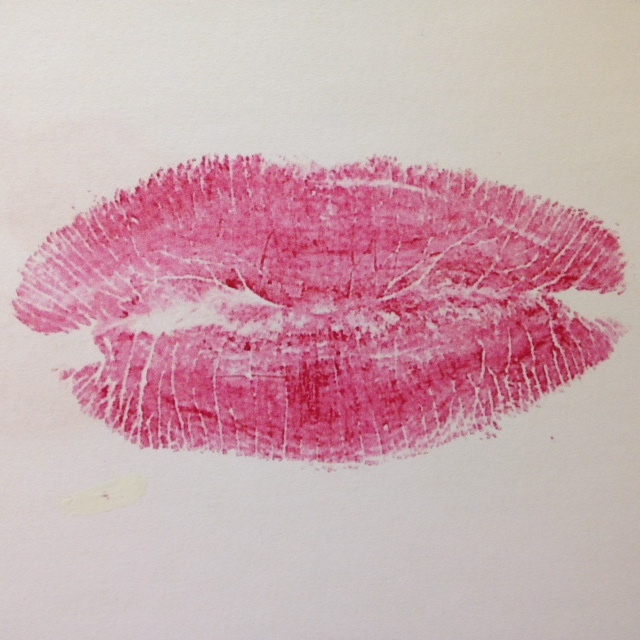 Four fellow librarians and I puckered up, put on some bright lipstick, and kissed a piece of white paper. 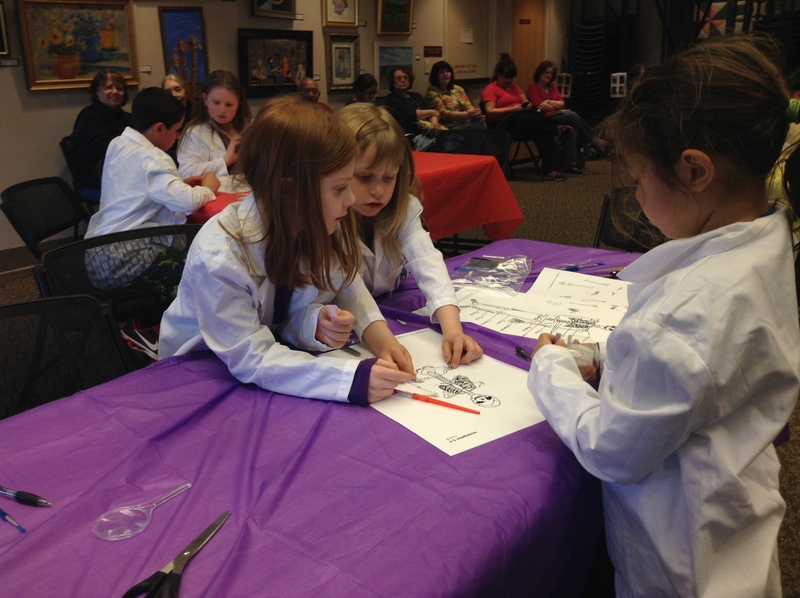 I then created enlarged color photo copies (enlarged by 200%) and made copies for each group. I also selected one of the 5 lip prints and copied it in black and white, labeling it as the lip print from our crime scene. At a recent crime scene a napkin was discovered with a pair of lip prints on it. 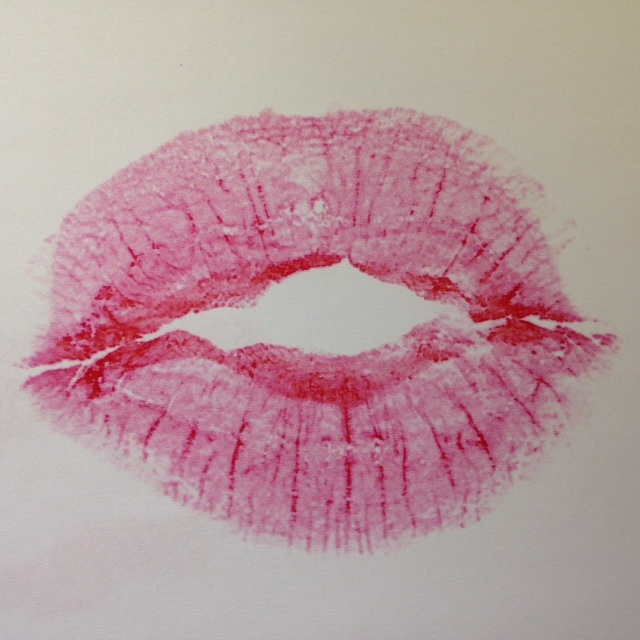 The police asked all five women who were present at the event to leave them with a sample of their lip prints. 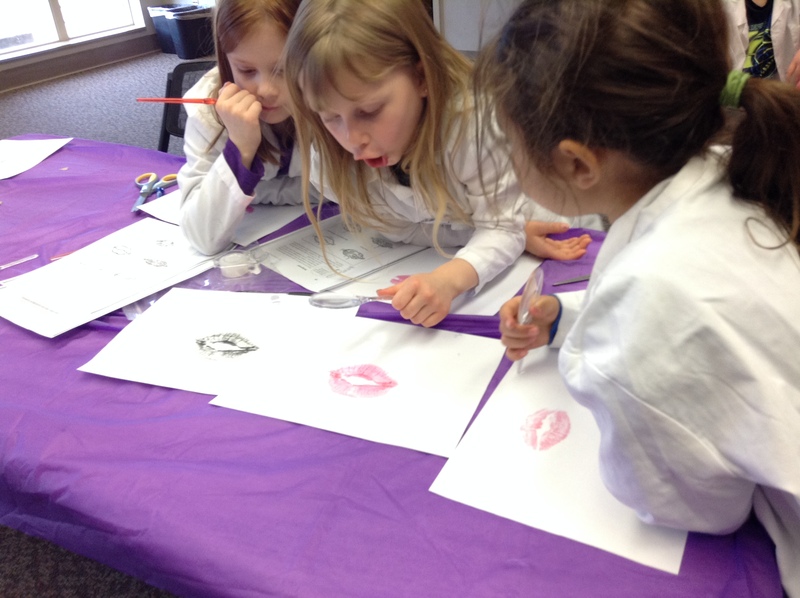 Our job was to analyze the five lip prints in color and compare it to the the black and white copy of the lip print left at the crime scene to see if we could identify the true suspect. 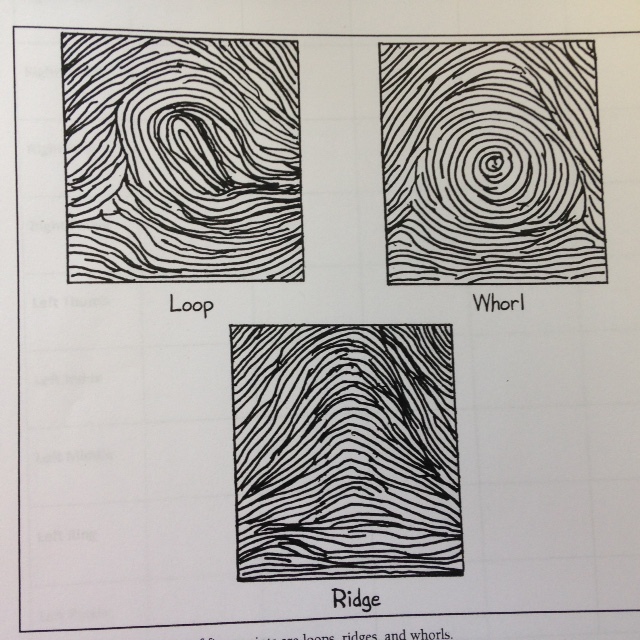 Now, there are a lot of versions of fingerprinting activities on line. While I used some reference material from the book above, I chose to go with a variation of the fingerprinting activity that uses cocoa powder to make the prints visible. My thinking was that this would be a less messy method than using ink pads. [Wrong!] I think if/when I repeat this fingerprinting activity, I will definitely just use ink pads. It will be ultimately less messy AND the prints themselves will be more visible. 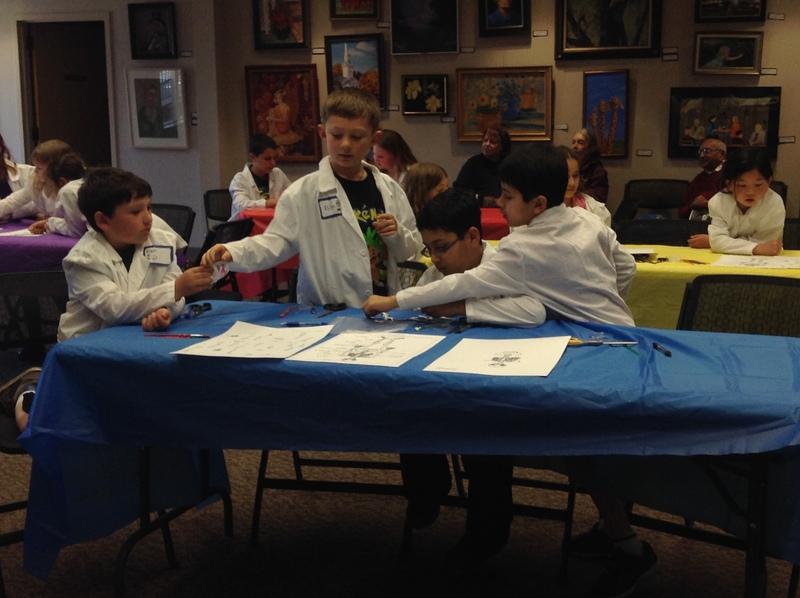 I’ll explain how the G3 scientists and I approached this activity…and where I think we had some pitfalls. But that’s the beauty of experimentation, right? You don’t always get the results you want/expect, but you learn and make better plans for future attempts. I made sure that each group had the materials I noted above. Fingerprints are most visible on a surface if the print ridges themselves have some oil on them. So I suggested that my scientists rub the side of their noses, or their scalps, before pressing finger tips onto the class sheets I passed out. The scientists were instructed to sprinkle cocoa powder onto the print area and gently dust away the excess powder with their brushes. [Pitfall #1: The brushes I bought were cheap and the bristles were a little too stiff. Brushing the prints actually smeared any evidence of fingerprints.] When the brushes weren’t working well, I suggested that the scientists gently blow the excess cocoa away from the prints. As you can imagine, there were a few clouds of cocoa drifting around the room…(but at least it smelled really good!). Interesting fact: Dogs’ noseprints can be used to identify dogs just like fingerprints can be used to identify humans. Each dog’s nose print is unique! When a print was exposed, the scientists were instructed to use clear (not transparent) tape and lay it directly on top of the print. The tape is then pulled up and placed sticky-side down on a piece of white paper. [If you use corn starch, you would lay the tape with print onto a piece of DARK paper so the white would stand out.] 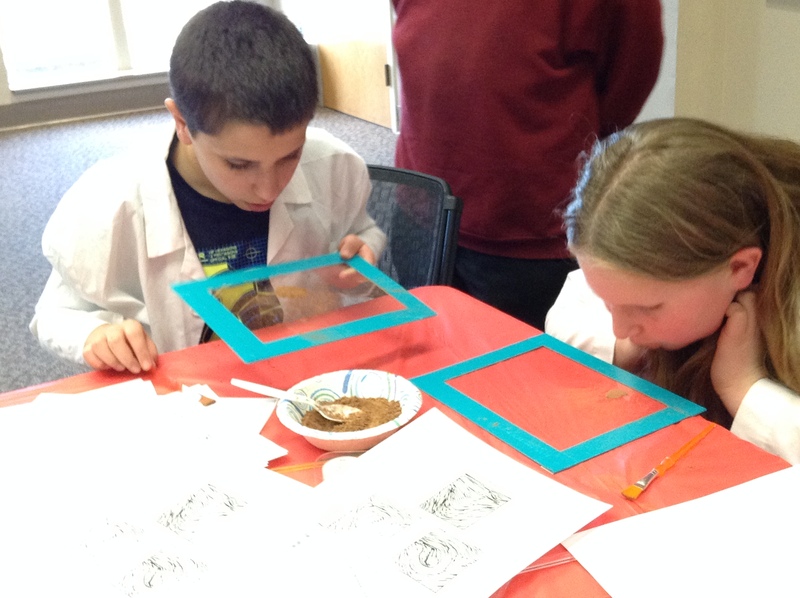 I had placed magnifying glasses at each table so the scientists could evaluate their prints better. 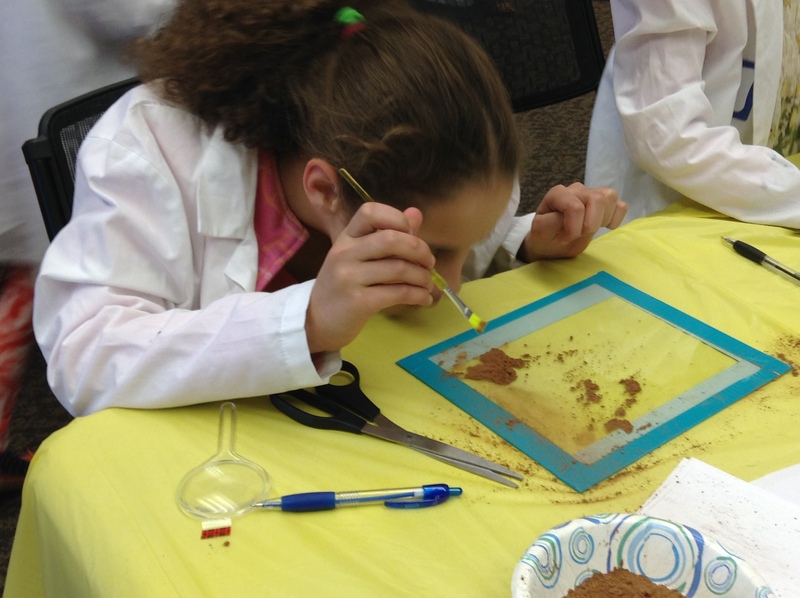 [Pitfall #2: The cocoa powder did not accentuate the prints enough, and combined with my low-end magnifying glasses, it was very difficult for the scientists to evaluate their own prints.] A few scientists had prints they could look at, and most of them were actually pleased simply with the fact that they were able to transfer a print from the glass to the paper for evaluation (despite the fact that they couldn’t see any of the patterns clearly). Still, in the future I will definitely use ink pads since the prints will be much clearer and easier for the scientists to evaluate.